The three-wheeled truck, having weathered World War II and every day after, carried its battle scars proudly as it hovered on the curb of Via del Plebiscito. Its V-shaped bumper was as jagged as a saw. Behind the wheel its latest owner, Zbysek Bailin, waited patiently, as though he were long accustomed to assassination on a rainy Wednesday evening. A red umbrella rounded the corner from the Piazza del Gesù. Zbysek took in a breath and turned the ignition key. The engine coughed to an idle, purred raggedly awaiting further command from its driver. 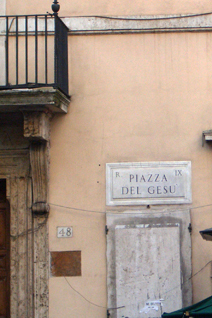 The silver-haired man ambled toward the intersection of Via degli Astalli that flanked the rear of the massive church. Purposely leaving his headlight off, Zbysek shifted into gear and bounced into the street. His foot pressed on the reluctant accelerator, the ancient vehicle climbing all too slowly up to speed. The man had reached the intersection, and as he passed beneath the streetlight Zbysek thought he might well be deaf—he was so lost in thought he didn’t seem to hear the rumbling truck, even as it barreled toward him at full speed. Clutching tight to the shaky steering wheel, Zbysek was hunched forward in the cab, eyes intent on his target. All he could see was the man’s bent back, crawling up Via Astalli like a praying mantis. In seconds the truck had jumped the curb and was upon him. 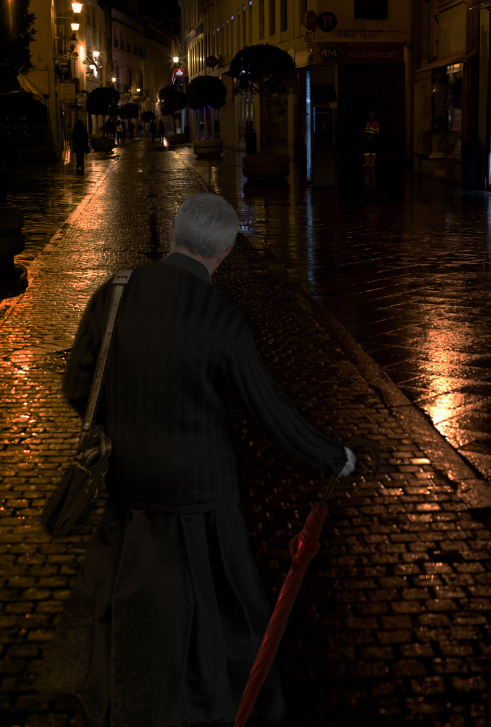 The man swung around with his books and umbrella, a look of sudden shock on his face—the smile erased. His coat fell open. For the first time, Zbysek saw his victim clearly in the light of the street lamp—the crisp white collar and the purple piping on his black vest. His target was a monsignor! Zbysek hauled at the wheel—but it was too late. His head struck the roof as the vehicle jerked over the body and slammed straight into the lamppost, thrusting Zbysek into the windshield and cracking his head on the glass. He climbed clumsily out of the cab and fell to his knees beside his victim. “Forgive me, father,” Zbysek finally choked out. The old man’s face was twisted with pain. His narrowed eyes were glistening, blood trickling from his lips. He reached his hand toward his Angel of Death. He seemed to want to speak. Zbysek lowered his head to hear. The monsignor’s final whispered words confused and frightened him, and he leapt for the three-wheeler and fled from the scene.